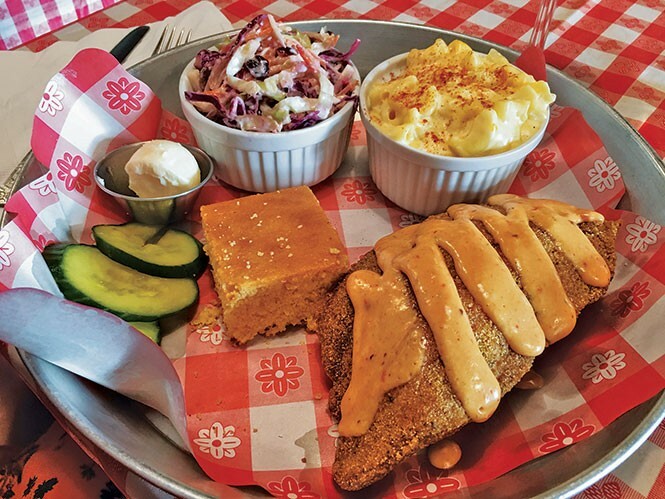 Find authentic Southern-style cooking at SoCo. In recent years, Southern-style comfort foods have become mainstays in some of the most hoity-toity restaurants. Even in posh places, you'll often find dishes on the menu such as macaroni and cheese, chicken and waffles or shrimp and grits. I think of it as the "Paula Deen effect." Don't get me wrong; I love Southern cooking. But I like the real deal, not a facsimile. I don't want chicken and waffles with a slab of foie gras or shishito peppers on top to fancy it up. I can't tell you how giddy I got when I learned recently that the great Viet Pham—food television personality and former co-owner/chef of Forage—is opening an eatery called Pretty Bird that'll serve Nashville-style hot chicken starting in early 2017. Bring it on! I've been burned too many times with faux Southern cooking out West not to be skeptical of a joint called SoCo (short for Southern Comfort). But, the diminutive restaurant/bar proved to be a handy place to meet City Weekly Arts & Entertainment Editor Scott Renshaw for an un-power lunch recently, which gave me a chance to check it out. I'm glad I did. When I say it's diminutive, I mean that it seats only about 25 customers, plus another 10 or so at the bar. It's half the space that used to home Shogun, and then Yellowtail Japanese Bistro. In the long, skinny eatery, guests sit elbow-to-elbow; it's a cozy place, with exposed brick walls and lots of natural wood, not to mention jazz playing throughout. The owner told me that SoCo will soon expand into the other half of the building to provide more seating. I hope they'll also expand the service staff. During my visits, there has been one person cooking in the kitchen and just a single person doing both bartender and server duties. Service can be slow, but it's always Southern hospitality-friendly. That's especially true if you're lucky enough to have Lafayette Pierre as your server. He's a terrific guy with a name that proudly announces his New Orleans heritage. During our lunch confab, Renshaw spoke approvingly of his fried chicken lunch ($10.99). That's saying something since his wife is a Southern gal, and he's been exposed to more of the region's cooking than most. The lunch specials (available Monday-Friday till 3 p.m.) are priced at $9.99-$15.99 and include options like fried chicken, macaroni and cheese, meatloaf with tomato gravy, and shrimp and grits, among others, and come with a side dish—housemade bread-and-butter pickles and a sweet potato biscuit or cornbread. While the boss enjoyed his meal, I was less enthusiastic about my po'boy. Like a Philly cheesesteak or a Jersey hoagie, a good one is deceptively difficult to do right. It begins with the bread, and SoCo's bread is way too dense and chewy—not nearly crisp enough to serve as the all-important foundation. Then there's the stuffing. When you order a po'boy in New Orleans, it's inevitably bursting at the seams with catfish, shrimp, beef "debris" à la Mother's, chicken or whatever. My shrimp po'boy ($13.99) contained only a handful of small poached shrimp—underwhelming, at best. The sandwich overall was bland in flavor, despite a pretty tasty red remoulade sauce. The housemade pickles alongside were very good, as was a side of hush puppies. The hush puppies, in fact, are the best I've eaten in Utah: soft inside and crispy on the outside, with bits of onion and red pepper; they're the real deal, even if they are served with the house fry sauce. SoCo might be small, but its libations list is large. It includes 16 specialty cocktails (like the "Sweet Georgia Brown," "Zydeco Rhubarb Martini," "Daisy Duke" and "Lynchburg Lemonade"). Also served are around 20 high- and low-point beers, soft drinks, iced tea (aka the "house wine of the South") and a half-dozen or so drinkable red and white wines. Seaglass Sauvignon Blanc was surprisingly versatile, serving as a bridge from fried chicken to shrimp and cheesy grits. During a dinner visit, I ordered the fried chicken plate. This is a great deal for $16.99: You get three pieces (breast, leg and thigh), plus two side-dishes, a cornbread muffin or sweet potato biscuit, pickles and remoulade sauce—a lot of grub for a great price. A two-piece version is also available for $14.99. It's an especially good value given that this is likely to be the best fried chicken you'll encounter in the Beehive. Renshaw was right: I've rarely tasted fried chicken that was so moist and tender inside and so crispy and crunchy outside. It's perfectly cooked with a judicious amount of spices, without overwhelming the natural chicken flavor. A terrine of hoppin' John—black-eyed peas and gravy over white rice—was a fine accompaniment, and the macaroni and cheese was second to none. I doubt it's authentically Southern, but they also throw a bone to vegetarians with their chicken-fried tofu ($14.99). It would go well with the Coca-Cola-braised collard greens and homestyle green bean casserole. By the way, at each table you'll find a bottle of the restaurant's exclusive "Grapes of Wrath" hot sauce, as well as some simple syrup—a must-have accoutrement for all sweet tea drinkers. For both Southern hospitality and flavors, I suggest giving SoCo a try. I think even Paula Deen would approve.